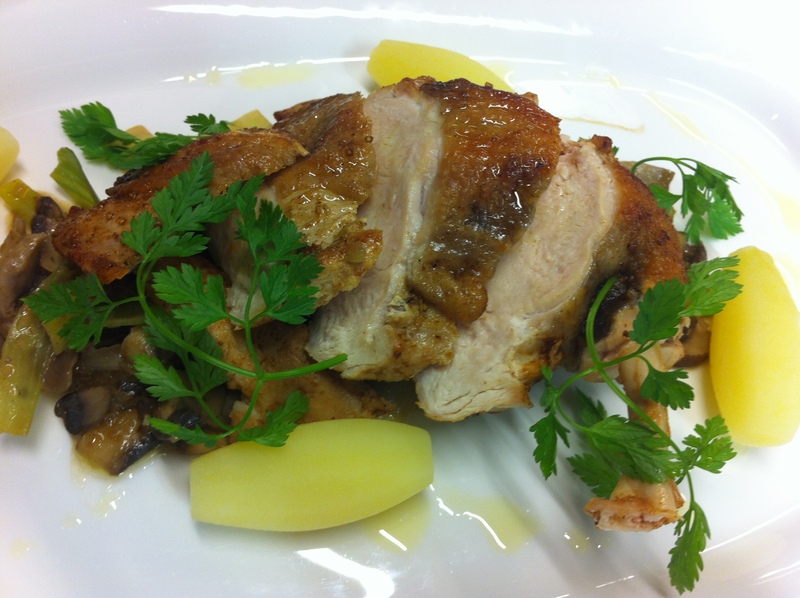 No one in class has ever cooked guinea fowl. 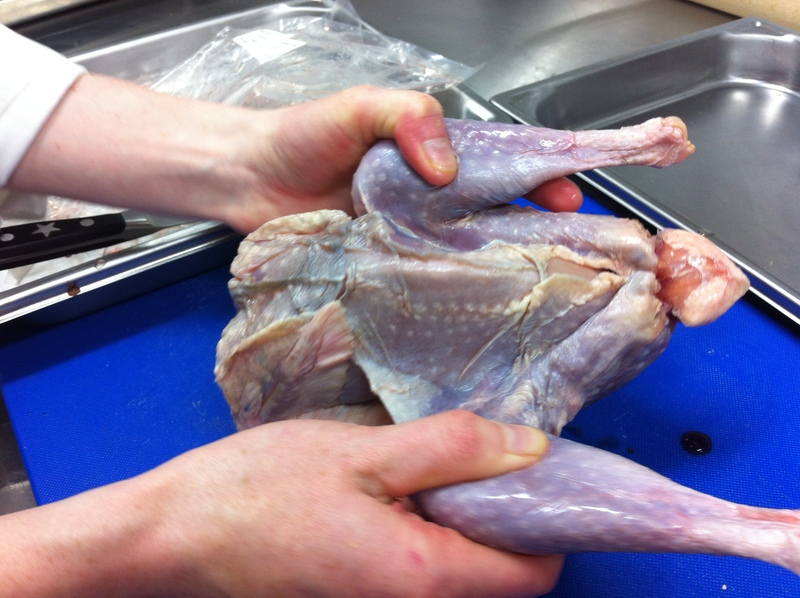 It’s about $30 a bird and much skinnier than a chicken so we need to be careful boning it so that there’s no waste. We’re cooking a delicate piece of breast and guess what? – game birds need lots of butter. Chef tells us that when he worked at La Gavroche in London they would go through a box of butter, that’s 10 kilos, for one service. And if you’ve ever wondered when to use salted and unsalted butter – it’s salted for meat, unsalted for fish. We don’t want to mask the flavour with a heavy sauce so we’re serving the pan fried breasts with leek and oyster and Swiss brown mushrooms. The turned potatoes are smaller today but I’ve got them nailed. In fact, I rather like doing them. Chef’s dish is the photo above. I forget again today to take a photo of my finished work but it looked good. I’m not going to rave about the flavour. I think it’s overrated and overpriced. 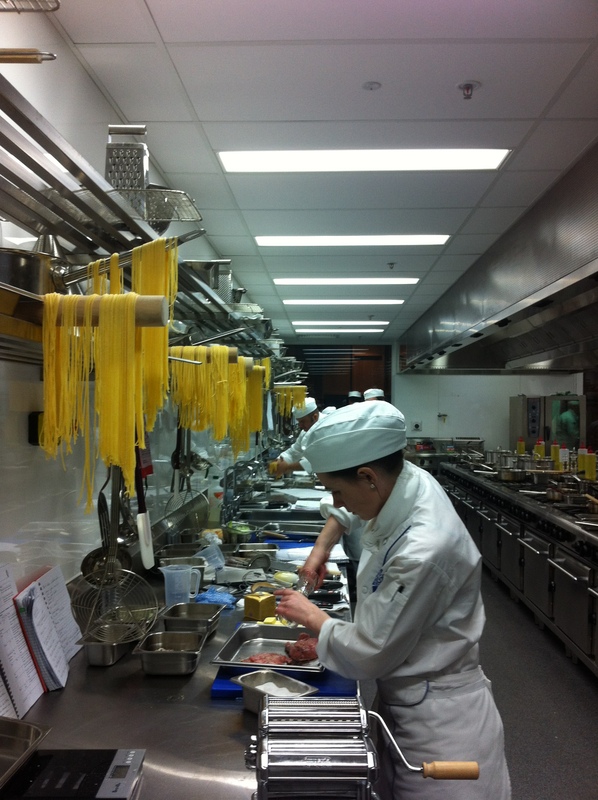 We also get out the pasta machines for the first time to make pate a nouille avec sauce a la tomate at au basilie. It has to be made at the last minute so that it doesn’t gloop together but most of us come up with a plan to make it a bit earlier and separate it out on rolling pins or pot handles. 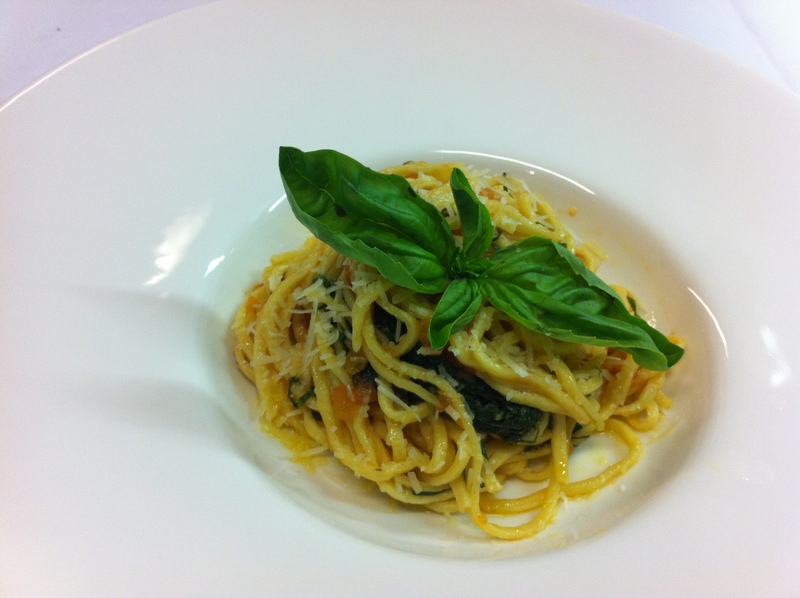 The recipe makes delicious moist pasta and the sauce is delicately flavoured with basil. Chef says the pasta shouldn’t be swimming in the sauce so unusually for me, I use restraint. It’s a very simple but tasty dish. You can’t go past fresh pasta with a fresh tomato and basil sauce. The day ends with animated chatter but it’s not about the pasta or guinea fowl. We are given details for our final assessment. We will be randomly allocated one dish from a list of ten. The dishes will test our methods and techniques. They include turning vegetables, cutting chicken, filleting fish, browning, braising, and pureeing. Everyone has their fingers crossed that they will get to make their favourite dish. My plan is to make each dish on the list at least once between now and 10 December. There’s also a one hour theory exam in the morning. Time to start studying. « Lesson 19 – Will the souffle rise?